The Lets Go Surfing (LGS) team loves the privilege of living and working on some of the world’s best beaches everyday. Our foundation was built on encouraging women into the surf. From the early days out of the back of a Kombi van, men, women and children learnt not only to surf, but to be safe in the ocean. Twenty-three years later, Lets Go Surfing is a professional team of passionate surf instructors operating at multiple locations, excited about sharing their ocean knowledge with people from all over the world. 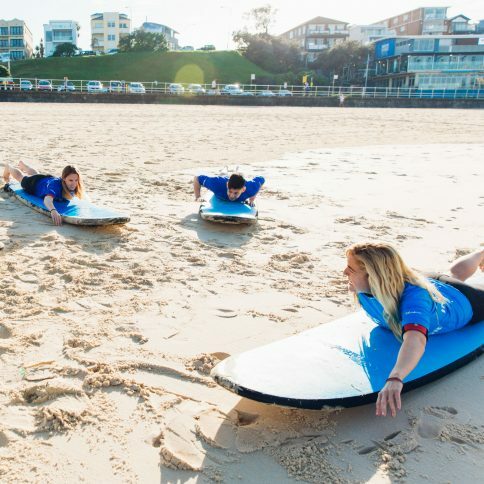 This September and October the LGS team will be providing FREE resident surf and SUP lessons to thank the local community in both Waverley, Randwick and Byron Shire for their support over the past 23 years. “We live and work in the local community and have the privilege of teaching surfing. ‘Free Residents Week’ is to thank our residents and to help provide access for all!” Brenda Miley, Surf School Founder. The free sessions are a wonderful opportunity for both adults and kids in the local area to try out surfing or stand up paddleboarding for the first time. All equipment is supplied, safe soft surfboards, wetsuits, UV rashvests , sunblock, zinc and all participants receive a commemorative certificate. “Lets Go Surfing is not just about teaching surfing, it’s about helping people feel good. Whether we’re helping people overcome a fear of the ocean, develop a healthy lifestyle, learn a new skill or just have fun, we live by the motto ‘Changing Lives One Wave at a Time’ ” Brenda Miley.